The essence of the policy challenges in a more integrated international production system is how best to ensure that the forces of international competition and cooperation work in a complementary manner to enhance global economic welfare and contribute to a more equitable distribution of the resulting benefits. Two broad tendencies underpin this challenge: on the one hand, the ongoing process of liberalization implies a greater reliance on market forces; on the other hand, private economic actors need to take on new responsibilities in relation to the social implications of their expanded opportunities. As a result, the relationships among the principal actors – firms, trade unions, governments – are being redefined. This raises specific problems in the context of TNCs and FDI policy, illustrated here in relation to issues related to employment, human resource development and industrial relations. In the FDI area, liberalization is the most important policy trend of the 1990s, as part of broadbased efforts to attract foreign investors. This trend is embedded in a broader liberalization movement – covering international trade in goods, external financial transactions, transfer of technology and, more recently, services and some aspects of labour movement – that seeks to enhance economic efficiency through the elimination of market distortions caused by restrictive or discriminatory governmental measures. These policies are interrelated and mutually supportive. Together, they are one of the preconditions for, and allow the further development of, the emerging integrated international production system, while receiving additional impetus from it. 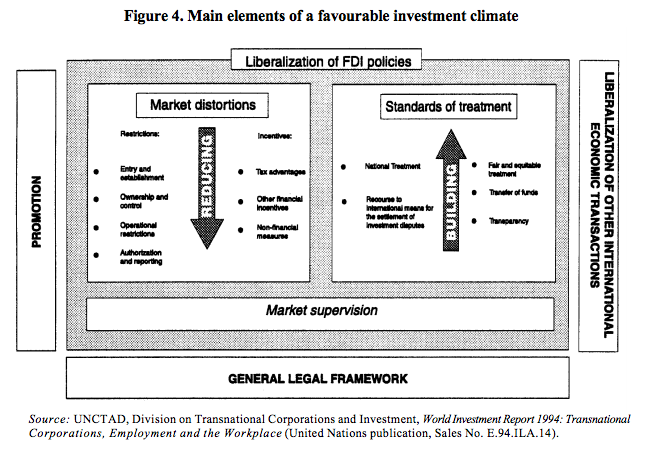 A number of important multilateral and regional agreements bearing on FDI issues (in particular, the Uruguay Round of Multilateral Trade Negotiations, the North American Free Trade Agreement and the Single European Market) and the increasing number of bilateral investment treaties (64 of them were concluded in 1993) have provided further momentum to unilateral FDI liberalization drives at the national level. These efforts are leading to a level of convergence of government approaches towards FDI never before achieved. Yet this process of liberalization has been far from homogeneous, and there are still considerable differences in the nature, breadth and depth of the measures taken. As the normative frameworks for FDI around the world become increasingly similar, these differences become more important for attracting foreign investors, and there is a real possibility that efforts to attract FDI can lead to increased “policy competition” among governments. Such competition could potentially be carried into more policy areas than in the past, since the increasingly integrated nature of international production elevates more and more policies from the domestic to the regional and international domains. First, the tempering or removal of market distortions resulting from restrictions applied specifically (and hence discriminatorily) to foreign investors; and the granting or withholding of incentives and subsidies that discriminate in favour or against TNCs. The most significant liberalization steps taken relate to restrictions on the entry and establishment of foreign investors, although all countries still keep some activities closed to FDI. In the developed world, restrictions are mainly found in the natural resources and services sectors. In developing countries, the picture is more complex. There, liberalization has had a tendency to focus mainly on export-oriented manufacturing industries, or projects involving advanced technology; more recently, the liberalization drive in these countries has expanded to services and natural resources. But, in general, it has not yet reached the levels typically found in developed countries. Similarly, although compulsory and minority shareholdings have declined in importance over the years as a means of restricting entry of FDI generally, ownership restrictions continue to be used as a tool for controlling FDI in specific industries and activities. In particular, this and other forms of local control over foreign affiliates’ decision-making are used in large investments in strategically important industries or in cases of privatization of public monopolies. Operational restrictions, for example on the employment of non-nationals, are still being used. However, performance requirements have in recent years shown a tendency to lose their compulsory character and, instead, tend to be related to positive inducements. General authorization procedures have been abolished in most developed countries and are tending to disappear gradually in developing countries as well (except for TNCs operating in certain specific industries), and are being replaced by requirements for registration or notification. Recent incentive programmes appear to discriminate less in favour of foreign affiliates. When they do, it is to attract them to certain industries, or to link them to exports, training or the introduction of advanced technology. The second category of measures involves the establishment of standards for the treatment of foreign investors. National treatment is central in this respect. Most developed countries grant national treatment to foreign investors, and an increasing number of developing countries are embracing that standard as well. The same applies to fair and equitable treatment. Similarly, developing countries have strengthened legal protection provided to foreign investors, including the possibility of recourse to international dispute-settlement mechanisms. Finally, in recent years, governments have made considerable efforts to publicize and disseminate information on their policy, normative and administrative frameworks relating to FDI and to ensure that this information reaches potential foreign investors, thus increasing the transparency of their FDI frameworks. Thirdly, the liberalization process requires regulations aimed at ensuring the proper functioning of the market and promoting broader economic and social concerns. These include, for example, competition rules, prudential supervision of banking and financial services, the protection of intellectual property rights, appropriate health, consumer and environmental standards and an effective system of accounting and reporting. More and more countries around the world are strengthening their frameworks in these areas. In addition to liberalization measures, other policies of host countries are also important for a favourable investment climate; and, as liberalization progresses, they become increasingly so. Thus, the existence of a reasonably comprehensive legal framework for business activities and a properly functioning legal order are required to provide predictability and stability. In addition, well functioning administrative infrastructures are necessary to ensure the effective implementation of the legal framework. Moreover, the close interlinkages between FDI, trade and technology imply that their respective policy frameworks need to be consistent to achieve maximum results. Still other important aspects of a favourable investment climate include such things as political and economic stability, the establishment of a sound macroeconomic framework, the upgrading of a country’s human resources and the strengthening of its physical infrastructure. These objectives are not easy to achieve immediately. But a number of promotional measures such as, for example, entering into bilateral and multilateral commitments to guarantee foreign investors against noncommercial risks, can help to attract investors in the short term. In sum, the process of liberalization of FDI regimes does not imply a weakening of the role of Government but rather a redefinition of some of its functions and the strengthening of others. In particular, internal policies that are aimed at facilitating the integration of the local economy in the international production system are becoming increasingly important . The liberalization of FDI policies and related international transactions means that TNCs are given more freedom to shape their strategies and structures. With this increased freedom comes also a greater ability to influence national and international economic activity and, hence, more responsibility, particularly social responsibility. This is recognized by firms, for instance, when they adopt codes of corporate ethics, and by shareholder and other groups, for instance, when they advocate the social responsibility of firms. The concept of corporate social responsibility helps firms to define and organize their relations with society. It first assumes that an enterprise is a distinct, identifiable entity with the capacity both to act and assume responsibility for its actions. Secondly, it describes the nature of a corporation’s relationship with society which includes not only following narrow legal requirements but also includes broader actions as defined by a firm’s social charter. Finally, the concept helps to determine which social groups fall within a corporation’s circle of social responsibility and why. General concepts of corporate social responsibility pertain equally to both domestic and transnational enterprises. However, applying these concepts to TNCs established in a diverse global setting raises special considerations and issues that may modify a firm’s specific definition of its social responsibilities. In fact, it gives rise to a tension – and an interactive dynamic – that is specific to TNCs: on the one hand, the duty to behave as good corporate citizens in the host countries in which they are established; and, on the other hand, the duty of adhering to broader self-imposed social responsibility standards formulated to apply to their corporate systems as a whole. In its application to TNCs, the concept of social responsibility relies on, among other things, the notion of appropriate roles as ordered by the subsidiarity principle, according to which social responsibility is best exercised by actors closest to a given situation. Societies are administered by governments, which bear primary rights and responsibilities regarding the welfare of their people. By contrast, corporations are principally responsible for matters most directly related to their own economic purpose and function, operating within prevailing legal frameworks. However, voluntary corporate actions pursuing broader social goals can derive from business capabilities and impacts. In exceptional circumstances, TNCs may even need to assume added responsibilities where other actors, including governments, do not or cannot carry out critical duties. In this sense, the role of TNC social responsibility appears broadest in developing countries and countries with economies in transition, and where governmental or free-market regulating mechanisms are not yet fully formed or effective. Operating international production systems in different national and cultural settings raises difficult issues as to how to determine the content and scope of a TNC’s social responsibility and apply it throughout its corporate network. The growing number of international strategic alliances and the expansion of low- or non-equity forms of investment also increase the difficulty in maintaining a corporate identity that can support social responsibility actions through a consistent set of policies implemented over widely dispersed and perhaps only partially controlled foreign affiliates. Historically, many TNCs exhibited ethnocentric tendencies flowing from a heavy reliance on directives from centralized headquarters in the parent firm’s home country. As the emerging integrated international production system introduces more dispersed operational authority, it could enhance a TNC’s learning experiences, thus improving its responsiveness to the needs of its host societies. A TNC will still require a common core of values if it is to maintain a unified corporate identity, but its internal norms might evolve more from a dynamic interaction between corporate and host country values, eventually matching more closely public expectations regarding how corporations should behave in relation to evolving international standards. A number of initiatives by the business community to establish voluntary standards – and by individual firms to adopt their own corporate codes of conduct-show that there is widespread awareness among TNCs of their social responsibility, as part of a broadly defined notion of self interest that includes a corporation’s stakeholders. A review of these standards and codes suggests a range of topics relevant to TNC social responsibility. Among them, those relating to employment and human resource development are particularly pronounced. Many TNCs have set forth their policies in this respect in their corporate codes, ranging from brief statements of principle to detailed policy manuals . Trade unions represent another group with a direct stake in shaping the broader policy framework concerning employment and workplace issues. As trade unions must deal more and more with TNCs, one would expect them to seek ways to match the organizational scope of TNCs by transnationalizing their own structures. However, because of many obstacles, including differences in labour market legislation, the problem of defining mutual interest among differently organized national groups of workers and the difficulties of organizing workers arising from the increasingly fluid relations within TNC networks, this approach is of only limited significance for the time being. For these and other reasons, trade unions internationalize some of their actions, as a means of strengthening their leverage in their relations with TNCs. Thus, while the social responsibility of TNCs is grounded internationally but implemented locally, the approach of trade unions is grounded locally but implemented internationally. Trade unions are taking two broad approaches to international action. On the one hand, efforts to strengthen cross-border trade-union solidarity and cooperation have led to the establishment of international bodies, among other things, to monitor TNC industrial relations and coordinate responses whenever and wherever appropriate. On the other hand, trade unions have looked to international normative frameworks to influence directly the behaviour of TNCs. The two approaches are not mutually exclusive, as is apparent from the Western European context. The combination of the two is likely to strengthen trade-union leverage in the face of international production. As to cross-border trade-union solidarity, international trade-union organizations are of two types- alliances of national trade-unions centres or confederations and organizations established at the industry level in the form of international trade secretariats. In many respects, the functions of these organizations overlap. However, the former have a stronger representational role in dealing with other international agencies, whilst the latter deal primarily with issues arising at the firm and industry levels. On a day-to-day basis, both of these types of organizations collect information and exchange it among affiliated members. In the case of some international trade secretariats, priority has been given to bringing together workers from the same TNCs, but employed in different countries, to form world councils. These councils have been important in creating a network of relationships among unions, but most TNCs have resisted accepting them as more formal negotiating partners, and the financial and organizational pressures on them are enormous. Beyond this informational role, international solidarity takes place through a series of increasingly intensive stages: the simple voicing of support for union action within a particular TNC; the provision of financial assistance and advice; direct pressures on headquarters; and fullscale corporate campaigns dealing with fundamental issues of trade-union organization. A high degree of planning and sophistication is required for more strategic responses. At the national level, industrial relations are most often conducted through a body of formal rules and regulations framed by governments. Trade-union efforts to replicate at least part of this framework at the international level have helped to establish various standards and guidelines, a number of which directly address the activities of TNCs, including some in the area of industrial relations. The two most important are the Tripartite Declaration of Principles Concerning Multinational Enterprises and Social Policy of the International Labour Organization and the Guidelines for Multinational Enterprises of the Organisation for Economic Co-operation and Development. They include general provisions on industrial relations, in particular, concerning locational flexibility, union recognition, effectiveness of action, access to decision makers and information, and consultation. Despite widespread initial enthusiasm for these instruments from the international labour movement, experience with them has led to a declining interest reflecting, in part, the slow and complex implementation mechanisms of these instruments. But, primarily, it is their voluntary nature that appears to have constrained their more widespread use. Despite the somewhat disappointing experience with international guidelines, trade unions have begun to renew their interest in international efforts, this time focusing on minimum labour standards. Issues raised regarding international labour standards have generally been associated with increased trade linkages. Deeper integration at the level of production through TNCs complicates this issue further. Although the greater mobility of TNCs has been seen as a potential threat to labour standards in developed countries, the worldwide affiliate networks of TNCs open up new possibilities to influence labour standards globally. However, care has to be taken that this approach is not misused for protectionist purposes. Particularly in light of the experience gained with international regulatory approaches, as well as the broad based reach of the liberalization movement, a new realism has characterized the efforts of the international trade-union movement over the past decade. One important manifestation of this has been a refocusing on efforts at the regional level. Developments in Western Europe – in the face of corporate restructuring to meet the opportunities of the enlarged Single Market and widespread efforts at policy harmonization – have placed great pressures on traditional industrial relations practices. That region has also seen the most innovatory responses from trade unions. In many respects, they represent a coming together of the two main approaches described earlier. During the 1980s, European voluntary works councils were established in a number of TNCs. Although largely informational, in some cases they have begun to take a more substantive consultative role. 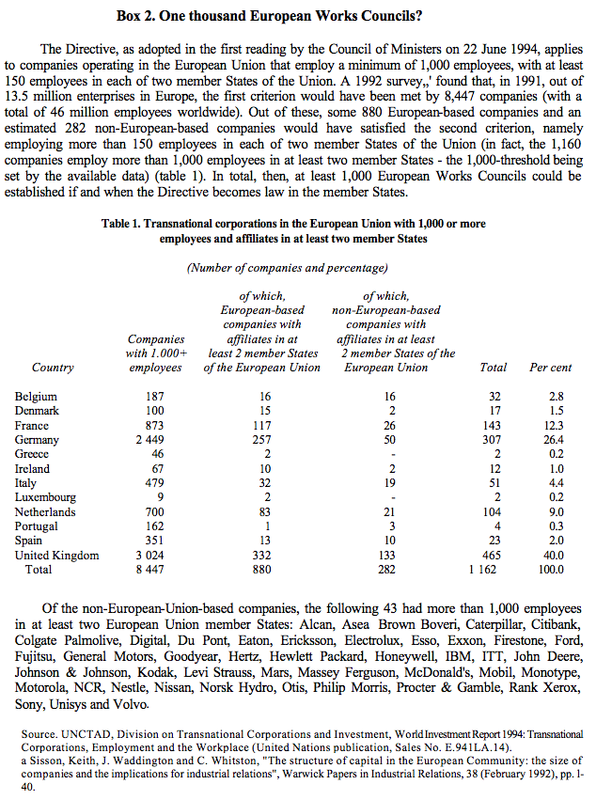 These initiatives at the corporate level have been complemented by legislative efforts through the European Union to extend information and consultation procedures in TNCs established in the European Union, most importantly through a draft Directive on the formation of European Work Councils (box 2). If and when this Directive is implemented, perhaps as many as 1,000 Councils may be established. Although a purely regional initiative, the Directive is likely to have relevance beyond the European Union . …. while governments need to be pro-active in human resource development policies. Despite the general trend towards a greater role of markets, the role of national governments in education and human resource development remains undisputed. If anything, in fact, this role has become more important, especially in developing countries, although the manner in which it is being pursued is changing. As competitiveness and economic growth are increasingly determined by created assets, it is important that governments coordinate their policies for human resource development with measures to promote FDI and channel it into priority areas for human resource development. Since TNCs must balance their competing requirements of globally efficient operations and locally responsive strategies, government policies for harnessing the capabilities of TNCs for human resource development must also strike the right balance in terms of supporting national goals while taking into account the needs of TNCs to be competitive in global markets. All national policies that are directly or indirectly related to human resource development have some impact on the appeal of a country to foreign investors. A literate human resource pool with basic education and skills; matching national education programmes with the needs of the private sector; and, particularly, implementing educational programmes that lead to the development of a workforce that is flexible and well adjusted to the evolving requirements of participation in a global economy are likely to add to the ability of a country to attract FDI. To achieve a competitive edge in international production, some countries or regions go further and match training programmes to specific needs of TNCs. This enhances their chances to attract foreign investors, but the costs of such programmes must be carefully evaluated in relation to their benefits. Since the main impact of TNCs on human resource development takes place through the training they provide to their employees in skills related to their production operations, as well as through training provided in the context of forward and backward linkages, government policies aimed at maximizing human resource development benefits should encourage FDI in industries and activities that offer the greatest potential for training as well as skill intensive local linkages. Assuming that the initial human resource base of a country provides sufficient absorptive capacity, fiscal or other incentives could be offered to FDI in industries or functional activities that are considered most promising in this regard. Host countries can also implement initiatives and policies that are directly targeted towards maximizing the human resource development contributions of TNCs that are already established in these countries. Thus, many countries have stipulated legal or administrative requirements for the provision of training for employees by foreign affiliates, under policies aiming at an overall improvement in skills acquired by the country’s labour force. Often, they involve a mandatory contribution by TNCs, for instance, as part of payroll levies. Another focus of policies in this respect are localization programmes regarding staff in foreign affiliates. At the same time, policies may link investments by TNCs in education and training to incentives provided to those firms. Collaborative schemes between governments and TNCs to implement training programmes are another means whereby host countries can mobilize foreign affiliates for human resource development. Investment in, and the effective use and management of, human resources are critical for countries as well as TNCs in today’s competitive global economy. Education, therefore, needs to adapt to changing requirements, including those of the private sector in a globalizing world economy. At the same time, if countries wish to tap the potential of TNCs in technologically sophisticated activities for human resource development, they must pursue policies that ensure adequate domestic absorptive capacity for skills and knowledge. Finally, governments need to ensure that the results obtained in terms of human resource development by TNCs are commensurate with the resources spent, whether from public or private sources. Perhaps the greatest potential that international production offers for human resource development lies in closer cooperative relationships between TNCs, trade unions and governments in the identification of skill shortages, training priorities and appropriate policy initiatives. The process of liberalization of international economic transactions in general and FDI policies in particular – and, more broadly, the worldwide acceptance of the market as the principal allocator of resources – is redefining the relations of the principal actors in the market with each other. The new freedom created for firms by liberalization means that they need to shoulder more responsibility, and social responsibility in particular. Trade unions, still largely rooted in their national environments, can count less on governments than in the past and, therefore, need to rely more on their own efforts, being confronted, as they are, with a globalizing world economy. Governments, finally, need more than ever to ensure that the principal assets of their countries – their people – are as qualified as possible to be able to deal with the fastchanging demands of the emerging integrated international production system. The network of micro-economic connections at the firm level is now so woven into the cross-border fabric of internalized and externalized patterns of producing and distributing goods and services that policy makers have few options but to recognize the new landscape of international production and international competitiveness. The widespread liberalization of FDI policies ... ... means that TNCs are given more freedom and, hence, need to assume greater responsibility ... ... and that trade unions can count less on government and, hence, need to rely more on their own efforts ... .... while governments need to be pro-active in human resource development policies.